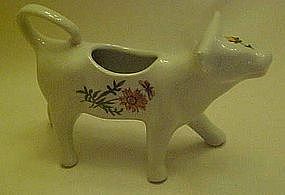 Nice heavy white porcelain milk pitcher in the shape of a cow. Hand decorated with sunflower design. Marked BIA Cordon Blue, San Carlos, California. Small blue tulip flower on the back side. Measures just over 4" tall and is about 6 1/2" long. Perfect condition.